This Easter Sunday, set a scene that is both classic and modern. 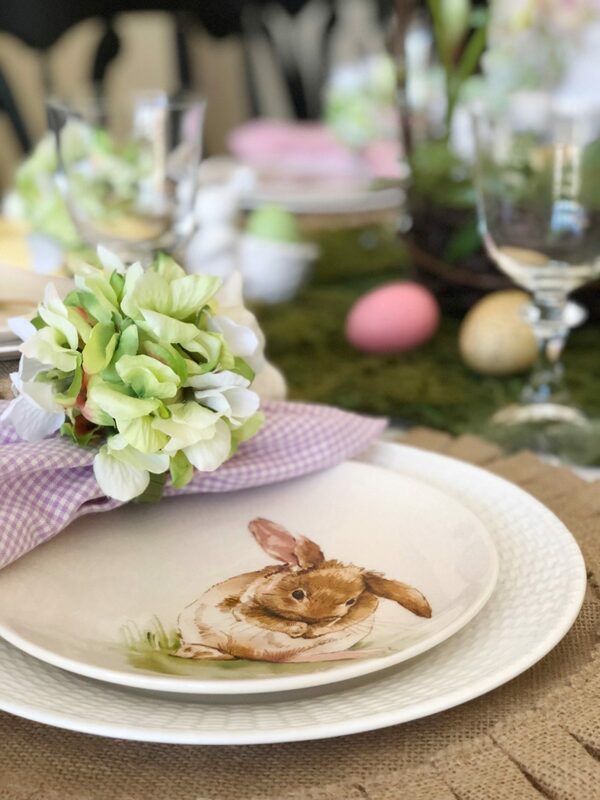 I created a simple place setting that includes details such as a Nantucket basket weave dinner plate topped with a timeless watercolor bunny salad plate. 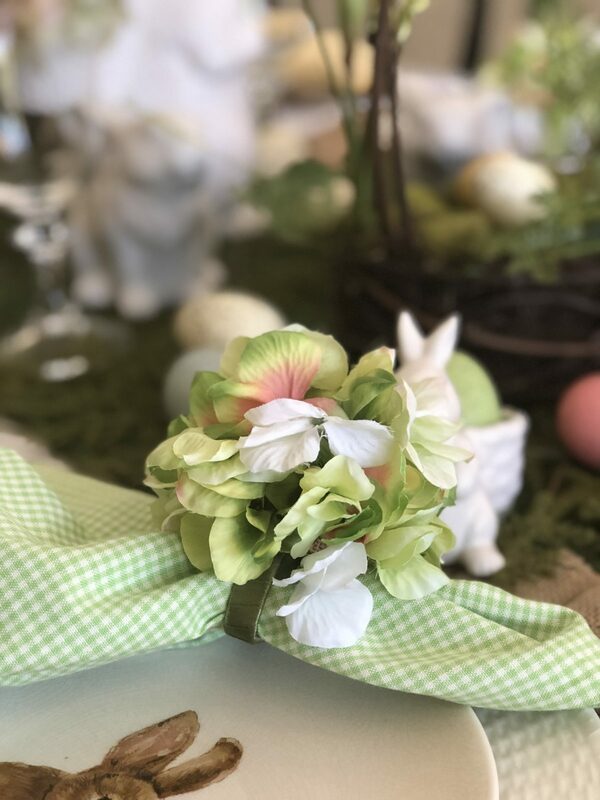 Decorative Easter eggs sit atop of a natural moss table runner with porcelain bunnies scattered about. There is one thing for sure this year, I’m ready for spring! Every year I love to celebrate the holiday with a pallet of pastel colors. I adore pinks and greens, purples and yellows, because they just set the tone for the season. 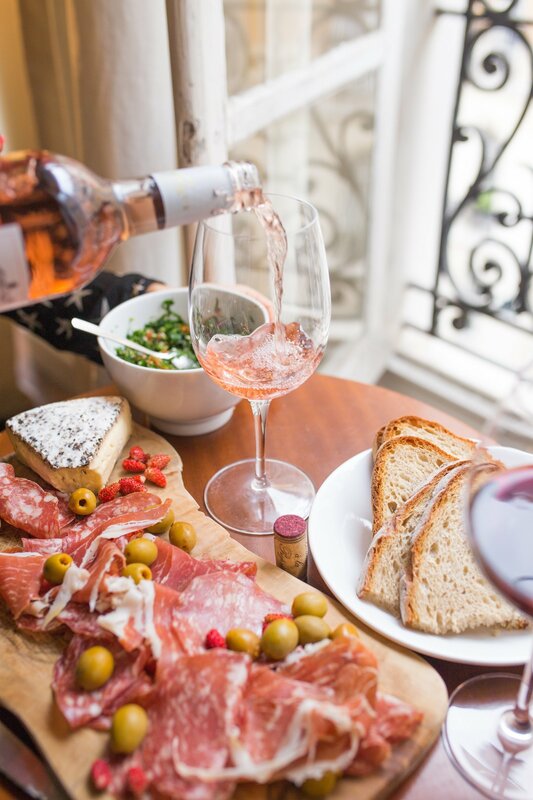 When setting a tablescape, I always like to work around one focal point. 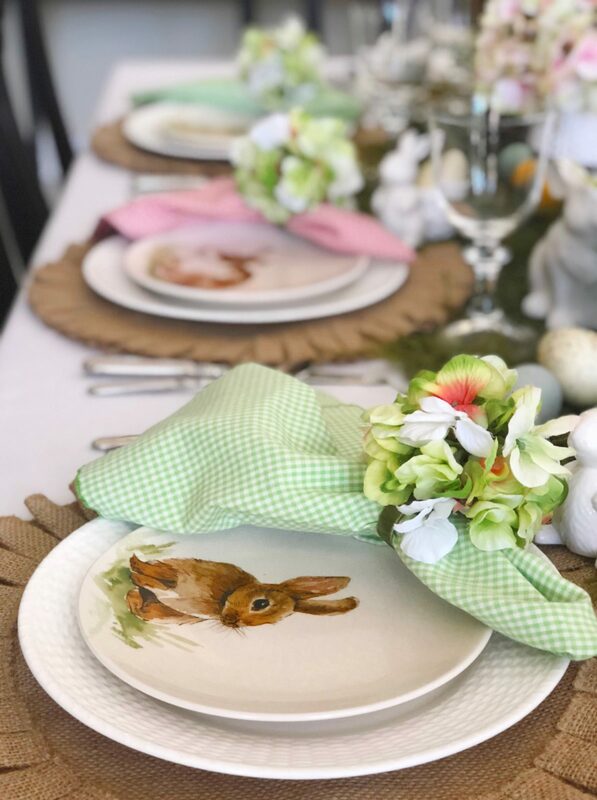 Last year, my mom and I found these gorgeous bunny plates at Pottery Barn, and year after year, they’re always the focal point of the table. They have the cutest design and every plate is a little different, so they paired perfectly with the rest of my decor. I love that they have a neutral color pallet, so they’ll still match if I switch up my tablescape colors year after year. As I was saying earlier, the more decorations you can use year after year, the better. You’ll save money that way instead of spending money on expensive flowers. These porcelain bunnies are a another fabulous option. They’ll look perfectly fitting no matter what color your dishes are (or your flatware) every year, and are certainly timeless. I found mine at Pier 1 and they were actually pretty inexpensive. 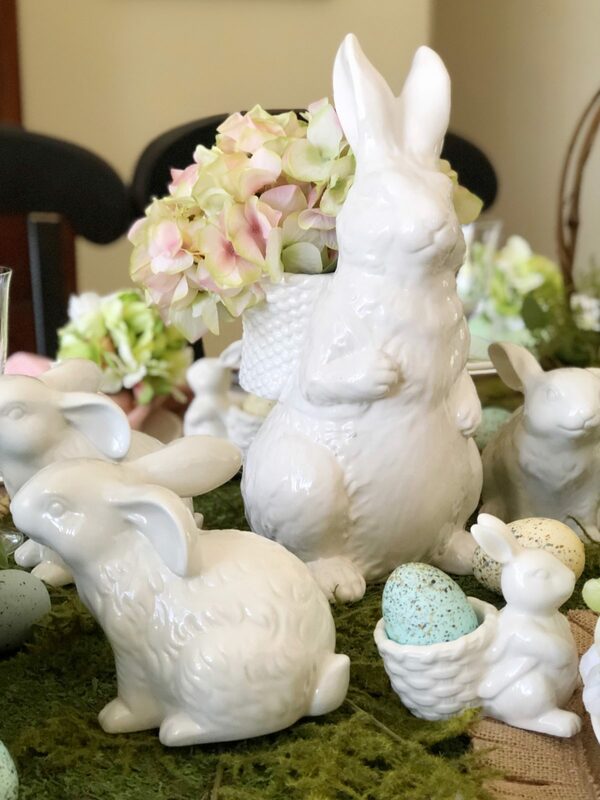 I gathered the bunnies and scattered them down the tablescape. For extra greenery, a moss table runner added the perfect touch. It doesn’t matter what type of bunnies you have, just add them down your table! It is Easter after all. Napkins are a great way to add a pop of color to your table. I paired these preppy plaid napkins with a floral napkin ring, and they really finished off the table. Napkins can be an inexpensive way to add color and impact to your table, and you can use them over and over again, unlike flowers. 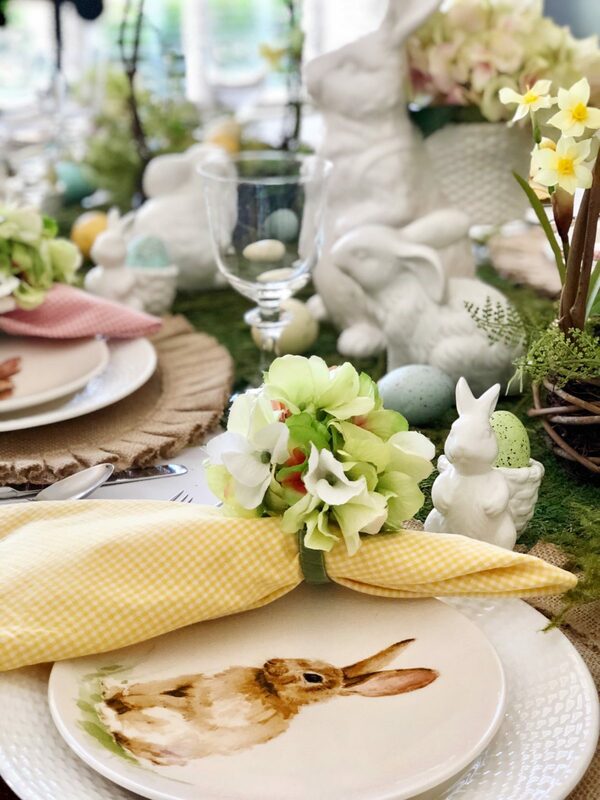 If you break down the elements of this Easter tablescape, it’s all very simple! Even if you don’t have bunnies, simple white vases of pretty pink and white silk flowers gives the same overall look and feel to the table. You could easily find inspiration in this design for everything from baby showers to bridal showers. And if you’re just starting out, simple white dishes are just fine too. Oh, my! What a delightful table! I’m a long-time admirer of the Nantucket pattern, and those bunny dishes are perfect with them. This is truly a delightful table! Happy Spring! Thank you so much! I love it so much also! Use it all the time. So inviting. Where did you find the burlap place mats? Where did you purchase your dinnerware, love them!